We're excited to again be reading general submissions of poetry, short fiction, and creative essays. As always, our submissions remain fee-free. Please consider supporting us by ordering a copy or subscription when you submit! Prairie Schooner’s intention is to publish the best writing available, both from beginning and established writers. We publish short stories, poems, interviews, imaginative essays of general interest, and reviews of current books of poetry and fiction. Scholarly articles requiring footnote references should be submitted to journals of literary scholarship. In principle, Prairie Schooner has no objections to the use of pseudonyms, but we require disclosure of their use to the editor before publication. We encourage you to read Prairie Schooner before you submit. Sample copies are available below for just $6.00, or order in our store. There's never a fee to submit to our general reading period, and we're grateful for the support we receive through donations and orders. 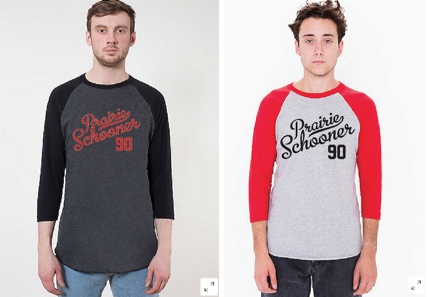 PRAIRIE SCHOONER: fifteen letters, endless possibilities. 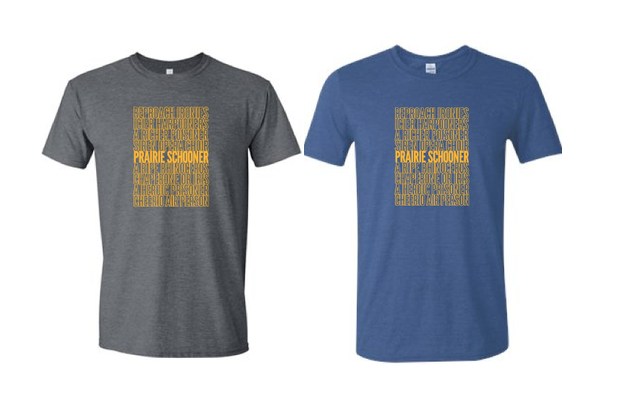 Celebrate the wild variety of all that is Prairie Schooner with one of our supersoft new anagram tees, designed in-house and hand-screened at a local shop. Choose from a heather blue with harvest gold lettering or from heather gray with gold. Gildan brand "supersoft" T-shirts in unisex sizes. True to size, and our staff reports no noticeable shrinkage upon washing. We're interested in reading imaginative essays of general interest. Scholarly articles requiring footnote references should be submitted to journals of literary scholarship. Send one essay at a time. Essays should be double-spaced and formatted using a standard font. Please note: we do not consider submissions simultaneously under consideration elsewhere. Send one story at a time. Stories should be double-spaced and formatted using a standard font. Send a single document containing a selection of 5-7 poems. Poems may be single-spaced but should use a standard font. We seek engaging reviews that articulate in a clear voice ideas of craft but also of literary context and/or place the work in our socio-political present. We appreciate reviews that begin by establishing a context the work can be understood within, and we appreciate when the reviewer can step out of the way so that the review is dominated by a discussion of the book, and not a discussion of opinions and impressions--though we do, ultimately, want to see some kind of judgement. We are particularly interested in reviews of books that can fairly be called diverse--we aim to publish a range of reviewers on a range of authors in each issue--and in reviews of authors' first books or recent translations. Books should be no more than eighteen months old by the time of publication (note that with our publication cycle, we are often reading to fill issues for two-three seasons from the time of submission). Reviews may consider a single book or take up two or three books together. No previously published work, please. If you'd like to pitch us before writing the review, you're welcome to do so through this form, but please note that even if the pitch interests us, we can't offer publication until we've seen the full review. Reviews should be no longer than 1,000 words, double-spaced, and formatted using a standard font. [Writer's Name]. [Title of book being reviewed]. [Press Name]. Our readers' loyal support and enthusiasm for what we do is why we're able to keep producing one of the oldest literary magazines in the country. Consider making a donation to support our ongoing mission to bring great work from around the world out into the world. Now in our 93rd year of continuous publication, Prairie Schooner seeks to publish the best in contemporary poetry, fiction, creative nonfiction, and reviews. A one-year subscription includes 4 issues of the journal and will begin with the next issue. Select a two- or three-year subscription for an even better rate! Prairie Schooner seeks to publish the best in contemporary poetry, fiction, creative nonfiction, and reviews. Volume 93, issue 1, features the essay "Terms of Venery" by Christine G. Adams, winner of our 2018 Summer Creative Nonfiction Contest judged by Carmen Maria Machado, along with poems from Samuel Green, Kelli Russell Agodon, p.e. garcia, Rasaq Malik, Linda Neal, Tresha Faye Haefner, fiction from X.C. Atkins and Heather Wells Peterson, essays by Kate Ryan and Michael Agugom, and more. It ships in late March. Now in our 90th year of continuous publication, Prairie Schooner seeks to publish the best in contemporary poetry, fiction, creative nonfiction, and reviews. We've got years of great issues full of excellent writing, whether you want that one essay by your favorite writer in print or just want a taste of what we're all about. PRAIRIE SCHOONER: Cheers to 90 more! To celebrate our 90th birthday, we designed these anniversary raglan tees with a throwback baseball script, hand-printed at a local shop. It's worth noting that most of us look much happier wearing them than these models do. Choose from a heather charcoal with black sleeves and red lettering or light heather gray with red sleeves and black lettering. American Apparel baseball T-shirts in unisex sizes. Super soft, true to size, and our staff reports no noticeable shrinkage upon washing.